Readers in Europe probably noticed that European Heritage Days were held about three weeks ago. These usually give the chance for Buildings-With-A-Past which aren’t normally open to the public to dust themselves down, smarten themselves up, and take a bow. Round here there was the labyrinth at Mirepoix Cathedral, three local Romanesque churches, a château at Belesta which is being restored, as a labour of love by the two who bought it. And, and and….so much to see, so little publicity for some of them. 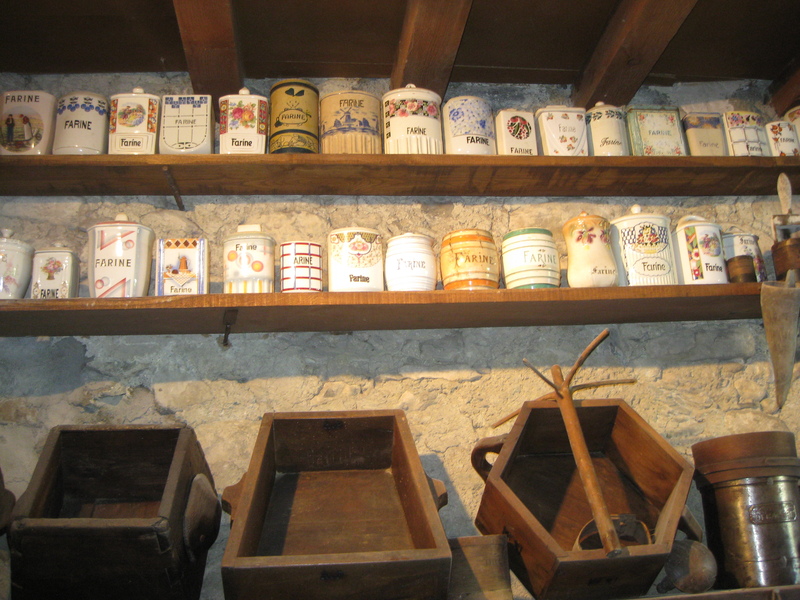 A chance conversation led us to a hamlet called Éspine, to see the ancient mill there. It had been in the family of the current owner for generations – until current owner’s dad sold it. This did not go down well. Son managed eventually to buy it back again, and has restored it with love and real enthusiasm. If he ever thought about having such a thing as a mission statement, it would without a doubt be ‘Passionate about Flour Mills’. 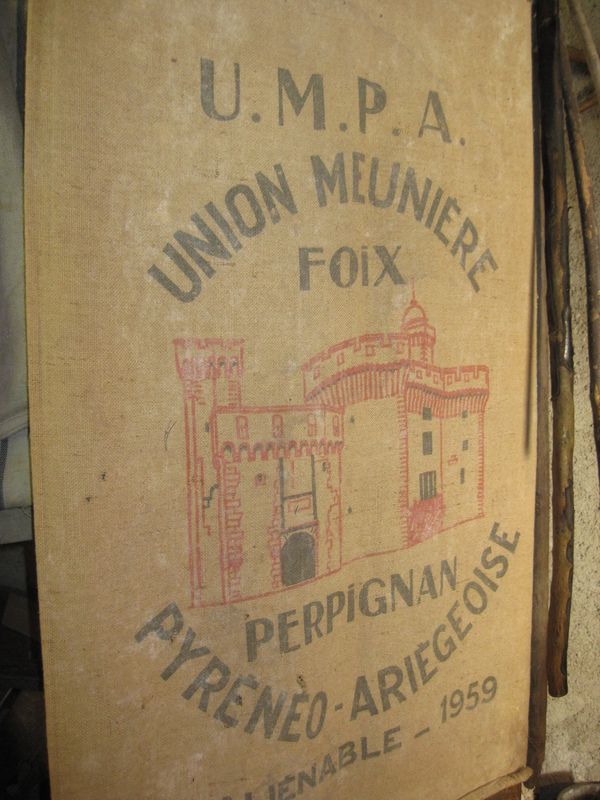 Monsieur – I don’t know his name – let’s call him M. Moulin, danced between mill race and flour sacks and ancient machinery and quirky collections of flour canisters, generating a hitherto unrealised ardour for milling among his many visitors. You wouldn’t know it was a mill. It looks like a stone house built over a stream. 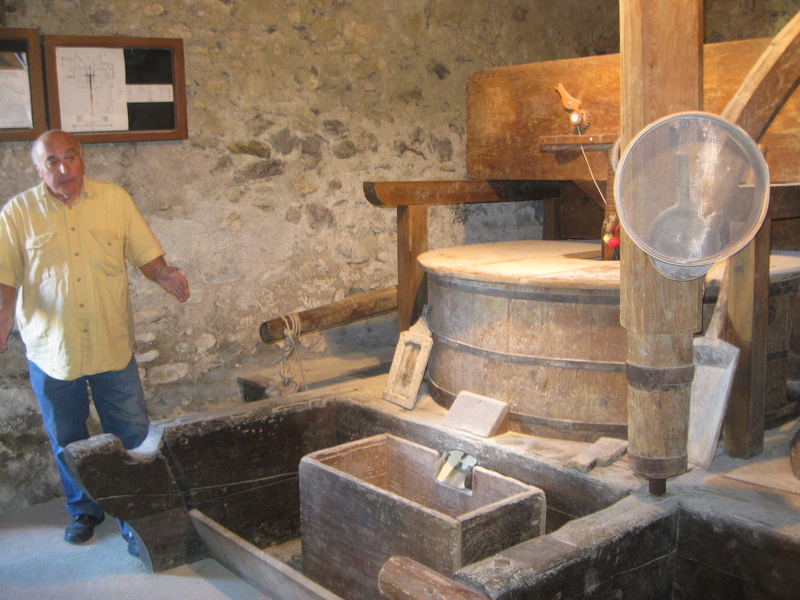 The mill-wheel’s underneath, using the stream’s fast-flowing energy. M. Moulin showed us a map of all the mills existing at the time that Napoleon had a sort of mill-census taken. There were thousands. One mill served the needs of about 300 people. Villagers would come in several times a week to have small quantities of grain milled, so it was the hub of the community, the place to gossip and catch up while waiting for your flour. Something odd though, something no scholar has been able to provide an explanation for. 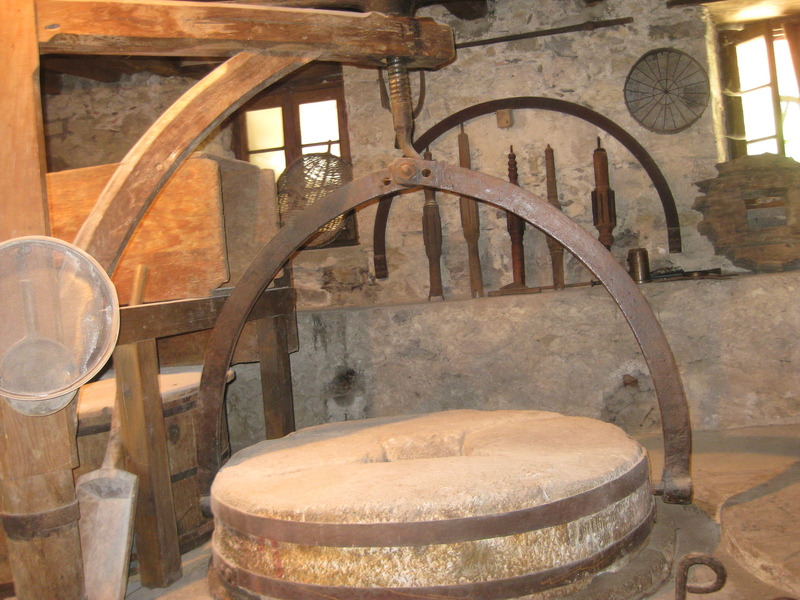 South of a line drawn through France from Bordeaux to Lyon, the mills were the wheel-under-the-mill type. North of this notional line, it was the mill-with-vertical-wheel-in-the-water, or the windmill-with-sail that we’re familiar with. M. Moulin reckoned that this was because the southerners were superior engineers: their type is harder to make. The twinkle in his eye told us he knew this might not always be true.